I always enjoy Laurie’s reviews on restaurants. This one doesn’t disappoint! 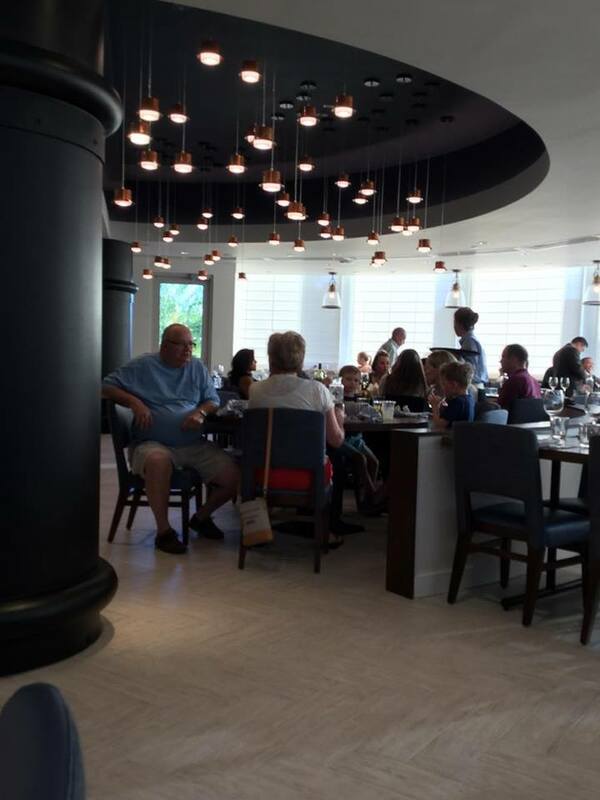 Check out what she has to say about the newly opened Paddlefish. On October 1, 1971, Walt Disney World officially opened with just two hotels and the Magic Kingdom. The Palm and Magnolia golf courses had been open a few weeks. Fort Wilderness would open in a few months. There were plans for residences at WDW. That November saw the opening of the Electric Pageant on Bay Lake. 1972, around December, we saw the Disney Vacation Villas open their first phase. Hotel Plaza opened up as an off-site Disney partner area that included Dutch Inn, Hotel Royal Plaza, Howard Johnson’s, and Travelodge. In 1973, Hoop Dee Doo Revue was the only non-hotel entertainment. The Golf Resort opened at the end of that year. It is now known as Shades of Green. Off in the distance a paddle wheel steamship opened on May 1, 1977. Lillian Disney christened her the Empress Lilly. It was a three story building built on a submerged foundation. Her name was in a red sign above the red paddle wheel. She remained that way until she closed in 1995 and reopened as Fulton’s. A neon replaced the ornate red sign and gone were the paddle wheel and smokestacks. Recently the empress was stripped down to the bones and became a Florida Coastal Cruiser, Paddlefish is her name. I walked the gangway into a lobby with a hostess desk decorated with metal fish scales. The walls have dark wood panels and the stairs also have dark wood. There are imitation black tufted leather benches that make the short more bearable. The aroma of a New England seafood boil hits you as you enter the lobby. Potatoes, corn, seafood, and old bay seasoning hits your nose and makes you so hungry. They led me through a narrow hallway, so it seemed as it fits a mobility scooter. The entire ship had large windows to let the sun shine in and guests look at the view. I used the elevator to the second floor. Again, beautiful views of Saratoga Springs and Disney Springs. The place has a posh feeling with comfortable seating, bright lighting, tablecloths, and fishy art. The chef came out and walked me through the menu. My wallet and my stomach are to small for what I wanted. They have a huge menu for lunch and dinner plus a late night appetizer menu and a brunch dinner. 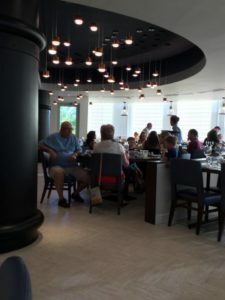 Among the appetizers are crab cakes, chorizo stuffed clams, charred octopus with cannellini beans, conch soup, crab meat topped French fries, calamari, salads, clam chowder, and ahi poke. I went for the shrimp cocktail with ketchup and horseradish sauce. The waiter brought a bucket for the shells. I stared in awe at a bed of seaweed held a pile of U8 or U12 shrimp. These were huge. 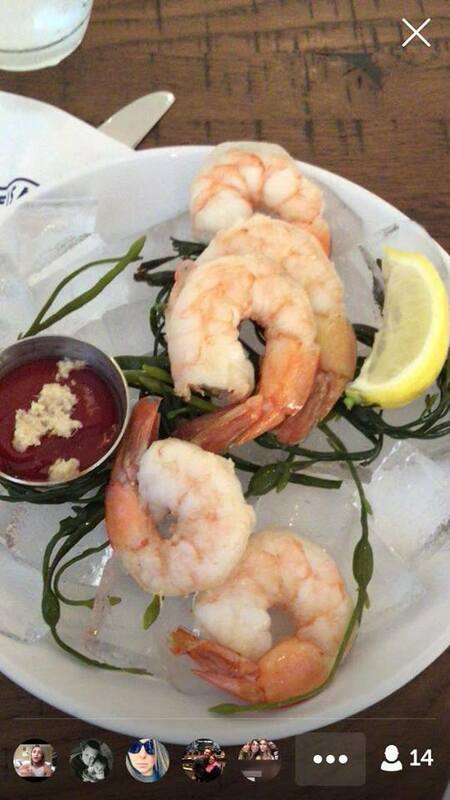 Each shrimp was deveined, perfectly cooked and delicious. I could sit there all day eating 5 orders of their fresh shrimp. Who needs fried green tomatoes and lobster corn dogs when there is a bountiful plate of perfect shrimp. The lunch menu features lunch items like crab cake BLT, burger, Floridian chicken salad, soup and salad entree, and fried clam roll. The dinner menu offers sides like Brussels sprouts, Maque Choux, green beans, sweet tater fries, crab mashed potatoes, and succotash. Guest may top their steak or seafood with uni butter, bearnaise sauce, blue cheese, Demi-glacé sauce, and Oscar sauce. Entrees include fish and chips, jambalaya, branzino, opah, lobster risotto, scallops, catfish, steaks, korobuta pork, chicken, lamb, hamburger, and a vegan dish. I have heard of black cod en papillote so I had to try this French dish. 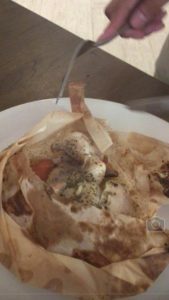 The term means “in parchment” as one places meat, vegetables, herbs, spices, and/or liquids to a parchment paper pouch. The pouch is sealed shut which causes the contents to be steamed. Since the pouch is not opened until table side there is no guarantee that anything cooked properly. In a fish stew the chef can pick out bits that are done or add more herbs and salt. A server stood next to my table and with great flare opened the bag and set the plate in front of me. Steam filled the area with the smell of cod, butter, and vegetables. The flaky black cod was enhanced by uni (sea urchin) butter, squash, and mushrooms to the point that I wish I had some bread for sopping up the butter. Sadly, proper ladies don’t lick the parchment but I am not too proper, lol. The one thing I wanted to try was the New England boil. Every entree has Jalepeño cornbread, boiled new potatoes, and boiled Plant City corn on the cob. The least expensive is the snow crab, boudin sausage, and gulf shrimp. One can make a custom boil by choosing (per item) from crawfish, shrimp, king crab, queen crab, blue crab, clams & mussels, and lobster. For $10, they have yummy sounding desserts like a brownie milkshake with caramel corn and chocolate ganache. They have southern favorite like key lime pie, carrot cake, and strawberry shortcake. The restaurant had a fully stocked bar with cordials, cognac, brandy, bourbon, scotch, wine, and draft beer. Cocktails include a Bloody Mary with crab, bacon, and shrimp; the Gold Rush with ginger beer, whiskey, and lime; and the Mad About Saffron Martini that has elderberry liqueur, vodka, and saffron. ALLERGEN WARNING: The air is permeated with shellfish such as lobsters, clams, mussels, shrimp, and crawfish. Also in the air are sausages, corn and potatoes. Old Bay seasoning contains black and red pepper, spices, celery seed, and paprika. Anyone allergic to black pepper, spices, celery, potatoes, corn, or shellfish should not come near Paddlefish. Paddlefish works well with allergies. I hate such a warning when a restaurant works so hard to feed guests on a limited diet. I enjoyed my meal and had no reactions. Very family friendly while having the bar for adults. The decor, theme, views, and staff are why I will be back. I highly recommend Paddlefish and feel they are my top three table service meals.